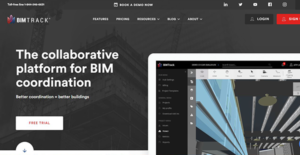 BIM Track is a cloud-based collaboration solution that empowers AEC professionals (construction project managers, engineers, and architects) with innovative BIM coordination workflows. It is a unified location for all communication, issues, and information required by teams to seamlessly manage projects from the design to construction. The platform is designed to help users create 3D models, receive notifications, manage issues, visualize metrics, and print reports. BIM Track is an easy to use, OpenBIM workflow solution with a flat learning curve for quick onboarding for all users including the technology-phobic. It has a responsive web-based interface designed to allow users to review project designs anytime, anywhere from PC or mobile device via the web browser. The solution supports both BIM Collaboration Format (BCF) and Industry Foundation Classes (ICF) to boost the flexibility and scalability of the project environment. Some of its main features include project workspace, communications, reporting, software integrations, notification system, issue metrics, basic issue management, and advanced navigation tools. BIM Track is an intuitive solution that enhances collaboration workflow in projects. It’s a robust software designed to help team efficiently track, communicate, and remedy design issues to enhance productivity. The platform archives all BIM coordination info in a central location to facilitate easy access and eliminate the inefficient and antiquated use of email communication. This increases across-the-board understanding, speeds up collaboration, and makes it easy to align the effort of each stakeholder. The solution functions as a reliable workspace where different real-time project data and information can be accessed anytime anywhere. Its user-friendly issue dashboard features classification tools that make it easy to organize and prioritize issues. This enables you to interact with more people in your BIM processes. Better still, the workspace provides a web viewer that enables you to merge, import, navigate, and display models from multiple CAD/BIM editing software to generate a federated model. Additionally, BIM Track is an interoperable software that integrates with popular design and clash detection platforms. It provides an open API to allow you to utilize existing custom systems or connect with software like the Microsoft Power BI to expedite processes. It’s also compliant with building SMART BCF format that lay a solid foundation for integration with popular platforms including ArchiCAD, Trimble Novapoint, DDSCAD, and Vectorworks. With BIM Track, you get access to multi-faceted data analytics tools as well as easy-to-understand graphics. This delivers insights into potential drawbacks within the project and helps you make informed decisions with the help of the KPIs. If you are considering BIM Track it may also be sensible to check out other subcategories of Best Building Information Modeling Software - BIM gathered in our base of B2B software reviews. Every organization has different wants and needs a system that can be personalized for their size, type of workers and buyers, and the particular industry they are in. For these reasons, no software can proffer perfect tools out-of-the-box. When you search a software system, first be sure what you want it for. Read some BIM Track reviews and ask yourself do you need basic tools or do you want advanced features? Are there any industry-specific functionalities that you are looking for? Find the answers to these questions to help your search. There are multiple aspects that you need to reflect on and these include your budget, particular business needs, your company size, integration needs etc. Take your time, check out a few free trials, and finally zero in on the system that offers all that you require to enhance your firm competence and productivity. How Much Does BIM Track Cost? We realize that when you make a decision to buy Building Information Modeling Software - BIM it’s important not only to see how experts evaluate it in their reviews, but also to find out if the real people and companies that buy it are actually satisfied with the product. That’s why we’ve created our behavior-based Customer Satisfaction Algorithm™ that gathers customer reviews, comments and BIM Track reviews across a wide range of social media sites. The data is then presented in an easy to digest form showing how many people had positive and negative experience with BIM Track. With that information at hand you should be equipped to make an informed buying decision that you won’t regret. What are BIM Track pricing details? What integrations are available for BIM Track?